In an age of advanced and high efficiency gas and oil boilers there has never been a greater need to safeguard what amounts to one of the most important and most expensive investments in the modern home - The central heating system. Even a small build-up of iron oxide deposit in a standard or modern efficiency boiler results in substantial efficiency loss and fuel wastage. So, not only does the system perform inadequately, it also costs more to run and maintain. Vist us on fair trades today and leave your reviews! 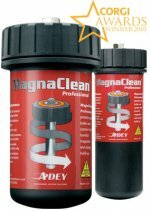 Our recommendation is to fit MagnaClean on every new installation on the basis that prevention is better than cure. 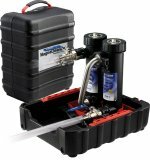 We also recommend installation after a system power-flush. the benefits are tangible - A more efficient central heating system, a warmer home, and a longer operational life. The benefits of effective central heating system flushing are well known to professional installers. A single power-flush will remove an average of 3kg of sludge and other deposits from an ageing heating systems. Where the system has incorrectly arranged cold feed and vent pipe, or where no inhibitor has previously been added, anything up to 7kg of sludge can be removed.